A preliminary design for a battleship prepared for the General Board. 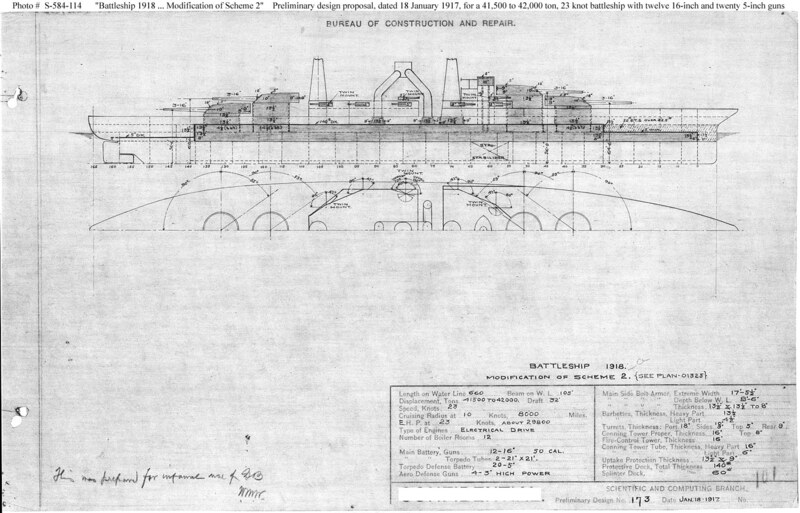 This design represented a step in the development of the South Dakota (Battleship # 49) class design. This modification to an earlier plan (see Photo # S-584-105) differed from the original "Scheme 2" in mounting 5-inch guns in six twin turrets and adding two additional guns in casemates for a new total of 20 5-inch guns in the secondary battery. The ships funnels, originally separated for reduced overall vulnerability, were trunked together above deck, a feature retained in the final design for South Dakota (see Photo S-584-132). This plan provided twelve 16-inch guns, electric drive machinery, and a speed of 23 knots in a ship 660 feet long on the waterline, 105 feet in beam, and with a normal displacement of 41,500 to 42,000 tons.